I love pine. It's a beautiful tree that stays beautiful no matter the time of year, or weather. In Summer, they are tall and proud. In Winter, they stay green and, if you're lucky enough to live in the more Northern climes, they provide a great snowy silhouette. I grew up wandering the deciduous woods in Northern Florida, so I got to experience the amazing scent of pine quite often as a child. Not to mention the, often painful, pine cone wars my friends and I would get into. Pine has always held a portion of my heart, and as an herbalist I'm just beginning to understand how amazing this lovely tree really is. The Pinus genus is a large one, containing over 144 distinct species of coniferous evergreen trees. Around the world, pines make up about 1% of the plant population, and according to the fossil records, they have been around for over 200 million years. In Florida, we have quite a few distinct species including Loblolly Pine (Pinus taeda), Longleaf Pine (Pinus palustris), Pond Pine (Pinus serotina), Slash Pine (Pinus elliottii), and many more. All species of Pine are safe to consume and there are no toxic look-alikes, so Pine is a good tree to start learning about. Traditional Chinese Medicine- Known as Song in Traditional Chinese Medicine (TCM), Pine works most on the lungs and intestines. Pine Nuts tonify Lung Yin, lubricate the lungs and intestines, stop cough, promote bodily fluids, and treat constipation. 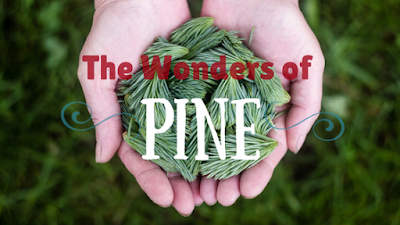 Pine Bark heals wounds, abscesses, relieves pain, treats arthritis, and treats burns. Pine Pollen is an excellent Yin tonic and, as such, is used for a wide variety of ailments. Native American Traditional Medicine- Various Native American tribes were known to use Pine Needles to treat Scurvy. They also use the inner bark, young shoots, twigs, pitch, and leaves to treat a variety of ailments including the common cold, flu, cough, pneumonia, fever, heartburn, headache, arthritis, bronchitis, croup, laryngitis, and kidney problems. Some tribes also used the inner bark and sap as a poultice for wounds. The pitch was used to treat boils and abscesses, to draw out splinters, and for rheumatism, broken bones, cuts, bruises, and inflammation. Ayurveda- Himalayan Longleaf Pine (or Chir Pine) is used, in Ayurvedic Medicine, to control Vatha and Kapha, to expel worms, heal wounds, for digestive problems, to treat nervous disorders, for skin problems such as wounds and burns, and in the case of respiratory and rheumatic disorders. Immune System and First Aid- The bark and needles contain high amounts of Vitamin C which helps improve the immune system. The needles and resin are also antimicrobial and can be used to help clean wounds. Vision Health- The bark and needles contain a high amount of Vitamin A and other carotenoids which can help prevent the formation of cataracts, increase vision strength, reduce macular degeneration, and reduces oxidative stress in the ocular system. Circulatory System- Pine increases your body's production of red blood cells which helps increase oxygenation in your body as well as prevent anemia. Respiratory System- Pine helps to sooth inflammation in the respiratory tract, relieves coughing, sore throat, and can even help relieve asthma. It helps prevent upper respiratory infections. Pine also is an excellent expectorant, helping your coughs to eliminate excessive mucus. It also is great at eliminating pathogens and bacteria in your sinuses. Needles- The needles can be harvested year round and make a delightful tea. They are high in antioxidants, and vitamins A and C. One of my favorite ways to use the leaves, is to make a syrup. Herb Geek has a great recipe for Pine Syrup here. The needles are great when added as a seasoning to your food, especially since they encourage healthy digestion. The needles can also be used as an expectorant, to help make your cough more productive in expelling mucus. Nuts- Pine Nuts have been used for food throughout the world. They are a great source of vitamins E, B1, B2, B3, B5, B6, and folate. They also contain manganese, potassium, calcium, iron, magnesium, zinc, and selenium. Resin- The resin is a sticky substance that Pine produces when it's been wounded. It helps protect the tree from opportunistic invaders such as fungus, bacteria, and harmful insects. The resin eventually hardens and over time (millions of years) becomes amber. However, this sticky substance can be used by us in similar ways to how the tree uses it. It's antimicrobial, antibacterial, and antifungal, so it makes a great addition to any wound salve. It's also helpful to fight off respiratory or gastrointestinal infections. Bark- Many scientists are currently studying Pine Bark for it's anti-cancer properties. It has also been used to improve the circulatory system, as well as to treat heart disease and varicose veins. It's high in vitamin C and other antioxidants as well. Pollen- Pine Pollen is highly nutritious, and though each Pine has a slightly different makeup of nutrients, most of them contain vitamins B1, B2, B6, E, C, D2, D3, A, folic acid, potassium, sodium, B-carotin, nicotinamide, calcium, magnesium, phosporrus, iron, manganese, copper, zinc, and selenium. In Korea, the pollen is used as a whole body tonic and to increase vitality. It's a great addition to anyone's food. However, the tincture of Pine Pollen is used to help increase testosterone levels in older men. Cautions and Warnings- Ponderosa Pine may not be safe for pregnant and breastfeeding women, or young children. The volatile oils in Pine needles and bark may cause problems in your kidneys if taken over long periods of time. Pine resin and amber can cause problems in the digestive tract when taken internally without a balanced formula. I hope you have a new appreciation for this amazing tree. I encourage everyone to take frequent walks in the woods, and breathe in the amazing scent of this beautiful plant. If you have any questions or comments, please leave them below. Blog articles are a good place to start, but I do encourage everyone to do their research and not to listen to advice blindly. I'm glad you enjoyed this post though and I hope you find that pine is a great ally for you.